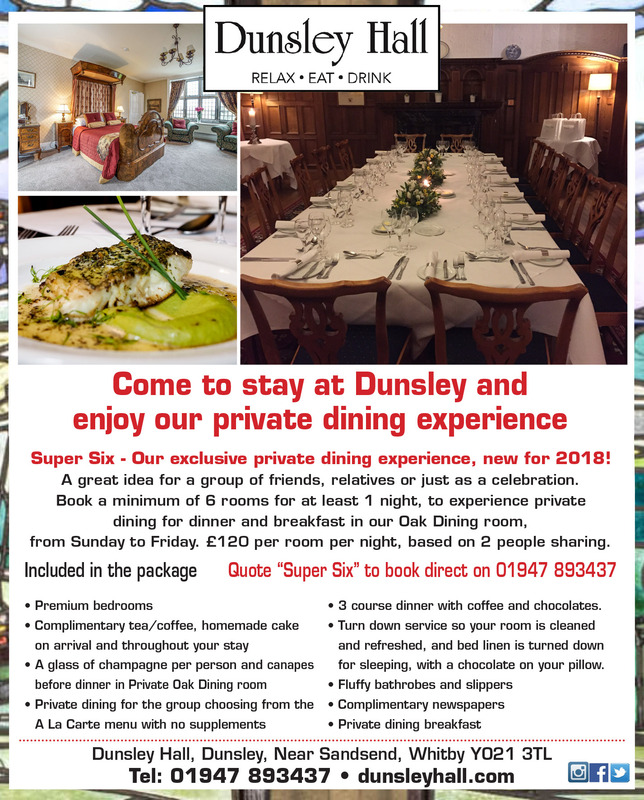 all that the Super Six private dining offers now available in summer from 15th July until end of September , Sunday to Friday excluding Bank Holidays for £150 per room per night based on 2 people sharing . Call 01947 893437 for more details. Located near Whitby on North Yorkshire Coast, Dunsley Hall Hotel is a country house hotel built as a shipbuilders retreat, nestled in the landscape where the countryside meets the sea. Enjoy 4 acres of lawns and grounds with views of stunning Sandsend beach. Stroll to Runswick Bay and onto Captain Cooks boyhood home. Staithes, then soak all your stresses away. Our chefs cook with seasonal and locally sourced ingredients using home grown fruit and vegetables from our kitchen garden when available. Relax on a traditional leather chair in our wood panelled Club Bar whilst enjoying a locally brewed beer, speciality spirits and our wines from our carefully chosen wine list. Book one of our unique experiences, rooted in our location, taking full advantage of our landscape nestled between North York Moors National Park and the glorious sandy beach at Sandsend. Visit our website regularly and register with us to keep up to date with all our special offers. Book directly with us to get the best deal on 01947 893437.